After falling in love with Rachel Khoo’s Boeuf Bourguignon, we thought we’d make Smitten Kitchen’s Mushroom Bourguignon for a vegetarian twist on this French classic. Kim tells how it went. I started by doing almost all the prep in advance, which was very easy but took a little longer than expected. I started by getting out the butter to soften and slicing two pounds of (huge) Portobello mushroom caps (I think this is what added the time as I was trying to be meticulous about making them all quarter-inch slices). I then moved on to chopping the carrot, onion, and garlic; stripping thyme leaves from the stems; and measuring the wine. There was no need to measure the vegetable stock as I had purchased a two cup container, which was exactly the amount needed for the recipe. I also got out the flour and tomato paste. I decided to save peeling the pearl onions and do those during the two later steps of sautéing the carrots and onions (10 minutes) and cooking the mushrooms (20 minutes). Two pounds of mushroom is a lot and I was a bit leery of putting them all in the pot and “searing” them as the recipe said. After putting them in and realizing they would never brown, I ended up taking about half out and doing them in two batches. I’m not sure if I was slow or had very watery mushrooms but mine released a lot of liquid very quickly. I wasn’t worried as they did brown but I knew all the liquid probably wasn’t the best for sautéing carrots, onions and thyme, the next step. The liquid released from the mushrooms smelled amazing and I decided to pour it into a measuring cup and use it for the broth in place of the vegetable stock. I consulted with Tony on this step to ensure it really did smell as good as I thought and he said go for it. The liquid measured out at just about 1.5 cups so I simply added a half a cup from my vegetable stock (which, now that is open, I think I will use in Tuesday night’s Moroccan Vegetable Cous Cous from Food 52) and set it aside until I needed it. I then turned my attention to sautéing carrots, onions and thyme for 9 minutes. I added the garlic for the last minute, during which time I mixed the butter and flour together and made good progress on peeling the pearl onions (not my favorite activity, but they make for a nice touch!). I then added the wine and it really bubbled up nicely and picked up the nice brown bits on the bottom of the Dutch oven. In went the tomato paste (honestly, I didn’t measure out the two tablespoons but kind of eyeballed it) and the mushroom liquid/vegetable broth. Back the mushrooms went into the Dutch oven (with the juices that had collected) and it was set to simmer for 20 minutes, while I continued to peel pearl onions. After 20 minutes, the Mushroom Bourguignon was starting to look very much like Bourguignon and I added the pearl onions and simmered an additional five minutes. I then added the butter and flour mixture and stirred it in and simmered for 10 more minutes. The last minute or so, I thought it was a little thin and as the directions suggested, turned up the heat a little bit. I tasted it and adjusted with a little salt and pepper and dinner was ready to be served. I choose to use parsley as the garnish and rather than using egg noodles, I simply served the Mushroom Bourguignon with whole grain bread so that we could sop up those delicious juices. We paired this with a wonderful 2012 Vietti Barberea D’Asti recommended by Wines by the Flask (which I also used when cooking). 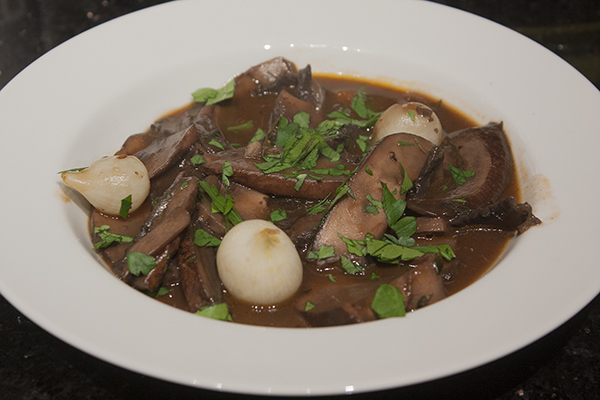 We loved the Mushroom Bourguignon—it was rich, earthy and had a wonderful, meaty texture from the Portobello mushrooms. It was a hearty and satisfying meal on a cold winter night. It paired terrifically with the Barbera, which also has a nice, big flavor with a touch of earthiness. I will definitely be making this again—perhaps even doing a “Bourguignon Off”—comparing Boeuf Bourguignon with Mushroom Bourguignon!